Homecoming is honored to present as their keynote speaker and facilitator, S. Suzanne Golas, CSJP; the Founder and Director of WATERSPIRIT. A renowned and gifted presenter, she will lead the morning program. Golas is the Sisters of St. Joseph of Peace NGO UN Representative focusing on Sustainable Development and Water. 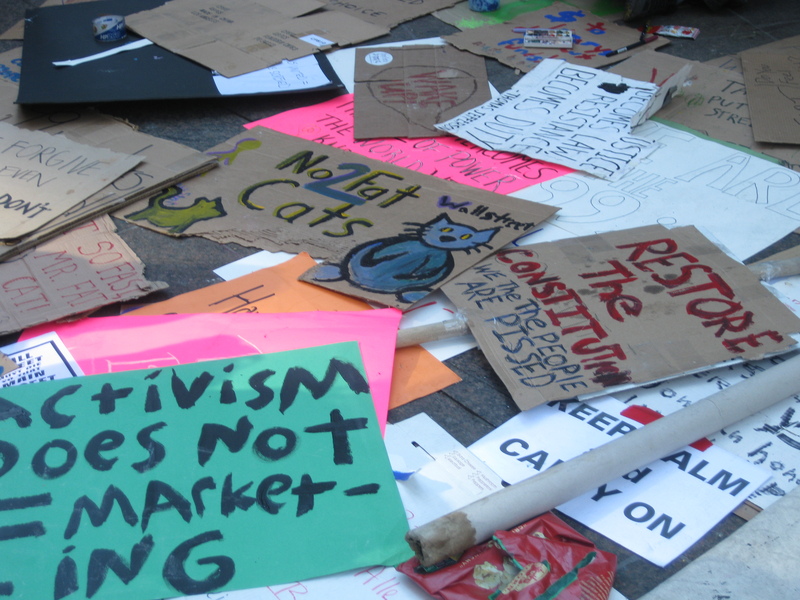 The afternoon program will include presentations from other Water Protectors and Long Island Activists including Adrienne Esposito, Co-founder and Executive Director of Citizens Campaign for the Environment. Esposito has a degree in Geology and Environmental Science from CW Post University. Additionally, she has served on the Brookhaven National Laboratory Citizens Advisory Committee, the Long Island Sound Citizens Advisory Committee, the Suffolk County Planning Commission, and the Brookhaven Community Coalition (BCC). Homecoming Farm is committed to the understanding that the human and natural world is one community of life. We believe that as we care for the Earth, we care for ourselves, each other and future generations, while creating sustainable communities. Beginning it’s 20th season, Homecoming Farm is one of the oldest NOFA NY LLC certified organic farms on Long Island. In addition to its Community Supported Agriculture (CSA) farm, Homecoming donates 20% of what it grows and harvests to The Mary Brennan INN in Hempstead. We offer educational programs throughout the year to schools, church groups and organizations interested in healthy living, organic growing, care of creation and mindful, peaceful living and welcome guests to our farm. Water is Life for all of us. The famous poet WH Auden wrote, thousands have lived without love, not one without water. (Although in my opinion, to live without love is not really living either.) But there is great power in those words. Our planet and our very bodies are made up predominantly of water. We ARE Water! Can you imagine life without safe water to drink? For millions of people it’s a daily reality. The world’s poorest do not have clean water or sanitation. This crisis is ruining lives. 663 million people in the world don’t have access to safe water. 2.4 billion people don’t have access to adequate sanitation. Last year when I went to El Salvador, the community we stayed in had access to unsafe drinking water from a well that was only available every other day. In one year’s time that crisis has worsened…the water is now only available once a week. Can you image living like that? Even now, one year later, every time I take a shower I think of that reality and of my good fortune to be living in the American Northeast where we have abundant water…at least, for now. As I watch it go down the drain I think, have I used too much? The water crisis is growing on a global scale; while our water safety is becoming more and more questionable right here on Long Island. The water crisis is Our Crisis and it is imperative that we be aware of what it means. Please consider joining us for our annual Spring Awakening on March 25thwhere we will address some of these issues together. 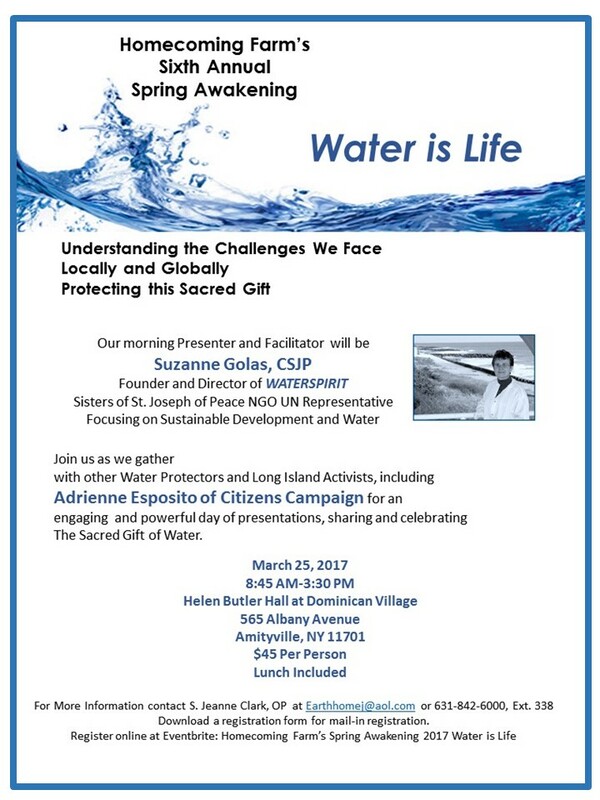 S. Suzanne Golas, Founder of WaterSpirit will be our keynote speaker and facilitator for the morning. She is her religious congregation’s NGO representative to the UN; and she is a renowned presenter and expert on sustainability and water. Our afternoon will be led by Adrienne Esposito of Citizen’s Campaign who was recently featured in Newsday speaking about 1,4-Dioxane, an emerging contaminant of concern found in Long Island’s groundwater and drinking water. We will have opportunities to share our thoughts and will conclude with a small celebration honoring the life of Honduran environmental martyr, Berta Caceres, as well as a HOPE-FILLED CALL TO ACTION! Finally, because of the focus of our Spring Awakening; I have really been thinking about water and that first line in our mission statement. We believe that the human and natural world is One Sacred Community of Life. Water is sacred, water is holy. From the beginning of human history we have known we cannot live without water. 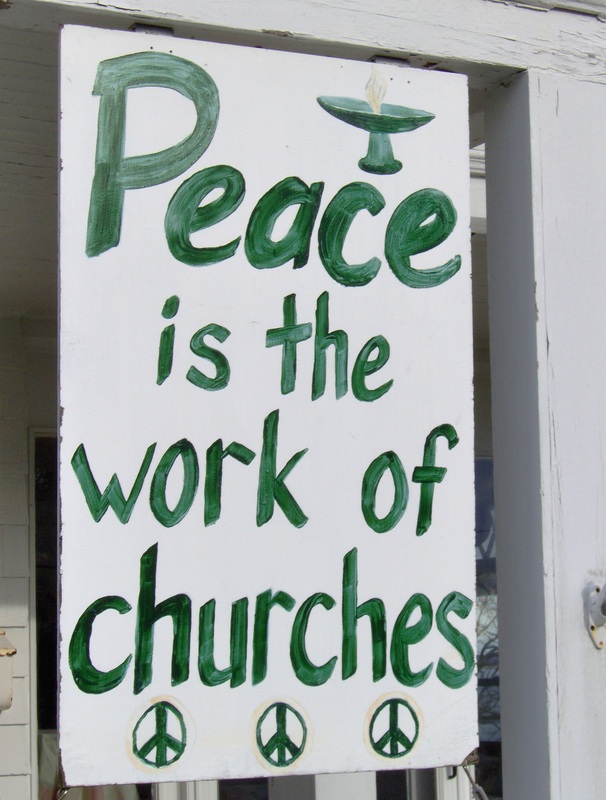 It is incorporated in every religious tradition’s ceremonies…from Indigenous peoples to the Judeo-Christian heritage with which many of us are most familiar. But if we see it in this light; why are we so cavalier about it? We dump toxins and plastic and every kind of garbage into it. We waste it and think nothing of letting it run from our faucets as if it is a limitless commodity for our disposal. In the end, I always come back to the words of Thomas Berry, the Universe is a Communion of Subjects not a Collection of Objects. We do this because we see water as an Object, not as a Subject with Rights to its own freshness and cleanliness and holiness. Rivers have a right to flow clear and sweet. Oceans have rights to be home to all manner of sea creatures and coral and not islands of plastic. Water has a right to its own Subjectivity and Sacredness. And we have an obligation to honor and protect it. Please join us on March 25th. It promises to be a day of insight, sharing and gift. HOMECOMING FARM’S CAPITAL CAMPAIGN FOR A WELL! For close to twenty years the Sisters of St. Dominic have shared their municipal water with Homecoming Farm. But as we prepare to expand our farm; we will need to build a well to make access to water a feasible reality for our long term sustainability. We will also need to expand our irrigation system. These are major additions to our infrastructure and so for the first time in our history, Homecoming is beginning a Capital Campaign to help us achieve these dreams. We will kick off this year-long effort at our Water is Life event and will be telling you more about it as the season unfolds.